Darth Vader posts a "selfie" on the new Star Wars Instagram account. The power of the force is strong in those who hold a smartphone. Star Wars dropped out of lightspeed and onto Instagram Monday, and the first photo posted was a selfie of Darth Vader. The photo shows the Sith Lord and father of Luke Skywalker adopting the pose so recognizable to a generation of smartphone users. Sadly, we'll never know whether or not he's pursing under that helmet. The new account has quickly attracted more than 91,000 followers and the first selfie of Darth Vader has been liked more than 26,000 times. A second image depicting Darth Vader and Luke Skywalker battling with lightsabers has since been added. The move to Instagram makes sense for the science fiction franchise as it begins its ramp-up to the release of a new series of films. Lucasfilm and Walt Disney Studios announced in November that "Star Wars: Episode VII" will open on Dec. 18, 2015. Originally slated for a May 2015 release, it was revealed in October that scribe Michael Arndt had exited the project with director J.J. Abrams and Lawrence Kasdan (co-writer of "The Empire Strikes Back," "Return of the Jedi" and "Raiders of the Lost Ark") assuming scripting duties. That swap had chat rooms and fanboys questioning whether or not the movie would be ready in time for a 2015 release. The original "Star Wars" burst onto screens in 1977. 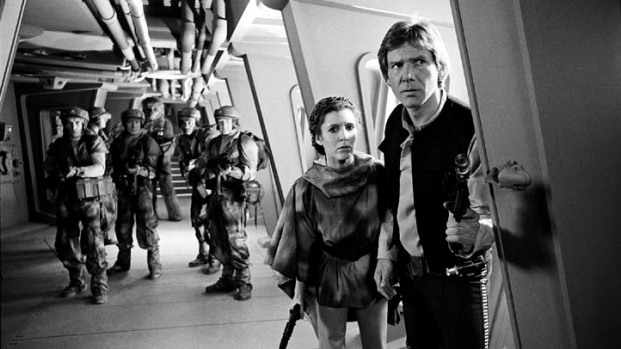 Shooting is scheduled to start on "Episode VII" in the spring of 2014.